English texts for medical students 7. There is an expression that describes the traditional three steps that doctors use to treat cancer: “cut, burn and poison.” Cut out the growth. Burn the cancerous cells with radiation. Poison those that remain with chemotherapy drugs. More than thirty years ago, a young American doctor proposed another way. Doctor Judah Folkman thought cutting the blood supply to cancers could block their growth. For a long time, many other scientists dismissed this theory. But, last month, the United States Food and Drug Administration approved the first drug that works the way he proposed. The drug is called Avastin. The Genentech company developed it to lengthen the lives of people with colon cancer that has spread in the body. It does not cure the disease, however. To test the drug, some patients received both Avastin and chemotherapy chemicals. Others received only chemotherapy. The people who had both generally survived for twenty months. That was about five months longer than those on chemotherapy alone. Avastin is a genetically engineered protein. It connects with a protein in the body that helps blood vessels grow. That protein is known as V.E.G.F., vascular endothelial growth factor. 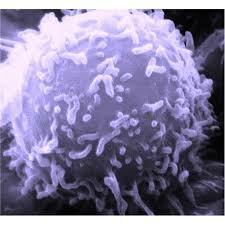 Blocking this growth factor can interfere with the supply of blood to the cancer and starve the cells. Avastin is designed to target the weak places in cancer cells. It does not damage normal tissue. Chemotherapy drugs kill cancer cells, but usually also kill other cells. This can cause infections along with stomach and intestinal problems. Today, Judah Folkman is a professor at the Harvard Medical School in Massachusetts. During the nineteen-sixties he worked at the Bethesda Naval Hospital in Bethesda, Maryland. Doctor Folkman thought that cancers put out some kind of material that made new blood vessels form. He thought it might be possible to develop new treatments if the vessel growth could be blocked. Today other drugs are also being tested to see if they can stop the formation of blood vessels. Avastin is one of three new drugs approved for colon cancer in the past two years. But some doctors also note that these new medicines cost a lot more than older treatments. This VOA Special English HEALTH REPORT was written by Jerilyn Watson.